A rock-solid defender and natural leader, Dale Chugg was a mainstay of the powerful North Launceston sides of the 1990’s before returning to his home town of George Town and leading the Saints to an unprecedented seven consecutive Grand Finals for six premierships. Born in 1969 in George Town on Tasmania’s central north coast, Dale Chugg made his senior debut for the George Town Football Club in 1986 at the age of 17. He spent three seasons with the Saints in the NTFA and NTFL competitions before transferring to North Launceston in the TFL Statewide League in 1989. The Robins had not enjoyed a great deal of success in their early years in Statewide football, but all that would change from Chugg’s first year at the club in 1989 as the club claimed the minor premiership, only to be bundled out of the finals in straights sets. Further finals heartbreak awaited North Launceston in 1991, ’92 and ’93 but this was in no way due to the lack of effort from players like Chugg, who by now had cemented his place at Centre Half Back in the North Launceston side. Over the next seven seasons, Chugg set about establishing himself as one of the premier defenders in the Statewide League. A Tasmanian state representative early in his time at North Launceston, Chugg went on to play in some of Tasmania’s most famous interstate victories, including the three legendary wins over the WAFL, SANFL and VFA in the mid-to-late 90’s under Andy Bennett. 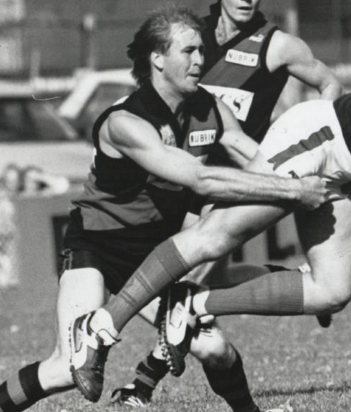 At club level he also finally tasted success, as North Launceston claimed TFL premierships in 1995 and 1998; the 1998 campaign was particularly noteworthy as the Bombers under Mathew Armstrong went through the entire season undefeated. By this point Chugg’s leadership potential had been recognised, and after serving a one-year stint as captain in 1997 he was re-appointed to the position after Armstrong’s departure, leading the Bombers in the last two years of the Statewide competition, both campaigns resulting in Grand Final losses to Glenorchy and Clarence respectively. After the Statewide League folded at the end of the 2000 season, Chugg opted to retire from North Launceston having played 214 games in 12 seasons for the club. His contribution to the club eventually earned him a place on the bench in North’s Greatest Team from 1945-1999. Upon his departure from North Launceston, Chugg returned to his original club of George Town – who were now playing in Division 1 of the NTFA – as captain-coach. In his first season at the helm, he led George Town to the Grand Final against Scottsdale, but a shocking display of inaccuracy from the Saints – 5.25 (55) – cost them any chance of the premiership as Scottsdale ran away to win by 35 points. Most clubs will respond in some way from a humiliation like that on Grand Final day, but instilled with discipline and great respect for each other by their coach, George Town took it to another level. Between 2002 and Chugg’s resignation as coach at the end of 2007 the Saints rattled off the next six premierships in succession, including a 174-point demolition of Deloraine in 2005. After playing in the Saints’ 2007 premiership win, Chugg announced his retirement from senior football after 170 games with George Town and nearly 400 senior games overall. Chugg then spent a couple of seasons away from the game before making an ill-fated return to coaching with TSL side South Launceston in 2010, but after only three wins from one-and-a-half seasons Chugg departed the club half way through the 2011 season.